1. For the benefit of the uninitiated, give me the one sentence description of the realm of Dica. A figment of my fevered imagination - a big figment, mind! You didn’t really mean that, did you? No! Well, in the bare bones: An immeasurably old castle kingdom, its walls encompassing a vast sprawl of city and towns, of estates, parks, colleges and villages, ports, harbours, farms and huge monumental works, and all spread upon and about an enormous coastal mountain. OK, I know it’s a long sentence, but it is a big place - think of a castle the size of Yorkshire! 2. “In following the characters through Dica, you will feel you have travelled with each of them.” When I’m writing, I have a hard time keeping just a few characters and a couple of plotlines alive. Your writing is much, much more intricate. What are the challenges of telling a multi-layered story? How do you make individual characters stand out? To be quite honest, I don’t have any problems handling loads of characters, When I first started out writing, I must admit I shied away from bringing too many people into the story, but I’ve since learnt that it’s got little to do with me anyway. The story is what it is, with as many characters as it needs to tell itself properly. The same with plot lines. You see, I have a very visual mind, and so find little difficulty holding it all there, like a well-travelled map. Just think of all the folk you know, and all the plot lines that run through their intricate lives. You’ve no problem holding all that in your head, now have you? And that’s because they’re real people, with real lives, doing real things. Well, it’s exactly the same with Dica. No, honestly, it really is! 3. Seems like every writer I know has an abandoned, half-finished manuscript stuck away in a drawer or at the back of a closet (if not an actual manuscript, at least an outline from some idea you’re fond of but just haven’t done anything with it yet…) What about you? What is it? Do you think you’ll ever finish it one day? Leiyatel’s Embrace was that very manuscript, left to moulder in the loft until unearthed during improvements a few years back, and so yes, I suppose I have now finished it, kind of, after more than thirty years. I’ve no other ideas as yet, nothing tangible, certainly nothing concrete. I’m a firm believer, however, in the work principle, not in the laggard’s hope of inspiration. The Dica Series came from an initial ‘feel’ - which I suppose was a kind of inspiration - but only grew into a proper, peopled story once I’d begun digging around in its world. It’s like everything, really: You get out what you put in, and I’ve dug around in Dica an awful lot. 4. “The King has lost his mind…” What are the challenges in writing a character whose worldview is so unhinged? How do you walk the line between making a character sympathetic versus making him or her unlikeable or unbelievable? You can make any character ‘sympathetic’, but you need to find all the subtleties and nuances that mark them out as real people, with their own strengths and weaknesses, all bundled together in typically chaotic human fashion. They don’t have to be likeable, as such, but do need to have enough complexity and facets for the reader to find something to latch on to, to have something they can recognise in themselves. Every one of us is a hotchpotch of the good, the bad and the indifferent, and this is what marks out any character as being believable. I tried to bring out King Namweed’s confusion, peeping through the bluster and comic pomposity the legacy of his own royal position brings. His is a real madness, a frightening one, one born of a weakness of mind we all run the risk of experiencing as we grow older. I tried to bring out his isolation - due his elevated position - and offer this as the reader’s way in to his character. Isolation is a strong fear in any social animal, and so should be the easiest for us to sympathise with. We mustn’t forget humour, of course. There are many kinds, but most are based on fear, the juxtaposition of ridicule and relief, relief that it’s not us! Again, I used this with Namweed, made him into a rather sad figure, one who unknowingly comes over as ridiculous. Most of us have some sympathy for the underdog, as though in gratitude for their taking the role we fear most for ourselves. I don’t think I ever wrote anything on the cell wall, not that I remember, but that’s probably because it was always kept too dark, and anyway, I’m not really a writer. I don’t aspire to being an author, you see, or a novelist, but I do like language - any language - and I do enjoy weaving yarns. I think, all told, I’ve probably only ever noted down half a dozen phrases and only ever used half of them. The serious answer is that I like to keep everything where I can always find it, in my head. Then, when I’m writing, it’s closest at hand. I work on the principle that if it stays in my mind then it must be worth putting into a book. 6. On your page on Amazon, the description says: “It's a slow tale about good people trying to make sense of what is going on around them as their lives simply seem to ebb away.” Where and how did you first come up with this writing idea? How long did it take you to get the whole story on paper? I started writing what was then ‘The Winds of Change’ around 1979, and it wasn’t really a writing idea at all. All I wanted to do was capture a place I’d so clearly seen, in my own mind. It wasn’t so much a visualisation, but more a lucid dream, one complete in all aspects down to the feel of the weather, the taste of the air, and the sounds of birds flitting about dark stone roofs or within dank, moss strewn yards. I knew Dica in all its richness well before pen ever touched paper - and it really was pen and paper then! As to the story, well, as I’ve already mentioned, I’d no real idea at the time if there was one at all. That immediacy, of the place I’d felt, meant I could easily draw the reader into the story’s landscape, but that was about it. Fortunately, there was a story hiding within it all, but it took more than thirty years to come to light properly. There’s much to be said for the passage of time, the perspective it slowly lends, and the subsequent richness it can bring. This may seem a little trite, or even flaky, but I truly didn’t write any of it. I honestly only acted as scribe to some other far more knowledgeable and skilful author. Whoever they are, and however they managed to work through me, they had a hell of a job teaching me how to ‘write proper’! I think they got somewhere in the end, though, but that’s probably best left to the reader to judge. 7. Tell me about your current work in progress (or pending release). As you know, Jill, what I write finds itself shoehorned into the fantasy genre, largely because of its setting. It’s actually mystery, though, with a Science Fiction premise. It’s the mystery aspect that means there’s little I can really divulge without risking giving away too many spoilers. My current work in progress is now with my beta/proof reader. It’s the third in the Dica Series, and will soon be published as ‘Last True World’. What I can say about it is that it holds massive revelations, ones that tie together and answer most of the mysteries introduced in ‘Leiyatel’s Embrace’ and ‘Of Weft and Weave’, the first two books. My tales are intricate, as you’ve already noted. They’re intricate because that’s the way of real life, and Dica’s just as real as any other true world. I enjoyed writing the series because it was the kind of work I love to read, the kind that doesn’t ‘write down’ to the reader, that doesn’t simplify in order to sell. There’s a lot of richness in both previous volumes, and a lot happening between them which, I saw from the reviews, needed taking further. ‘Last True World’ is actually a product of my readers, the further story that grew from their reviews and comments, and so it’s to them that I’m almost wholly indebted. 8. Besides warm fuzzies for the stories and praise for the writing, what do you hope readers will think and feel while they read the Dica series? When they’re finished? I genuinely do hope that people first and foremost get pleasure in the reading, that they enjoy my style of prose and the visual nature of it. I know I’ve created a convincing world. I also know I’ve populated it with believable people, despite their outlandish predicaments and behaviour. What actually fascinates me, though, and therefore what I’d love readers to find most engrossing, is the complex tale, and the surprising twists and turns it takes. I also enjoy creating innovative, novel and surprising incidents, settings and plot devices, so I’d love the reader to be thrilled by those too. Above all, though, I want to leave readers thinking. I want ideas to have been sparked in their minds that give a totally different light in which to view their own worlds. 9. There’s a bit of a bias in this question… There are illustrations in your books, drawn by none other than yourself. How do you think the book would have been received without illustrations? I don’t think it’s made much difference, in my view. I may be wrong, but few people have made mention of the illustrations. They were put in as a bonus, really, not as an essential part of the tale. The few who have commented say they did add to the reading experience, but to what extent I don’t know. They’re only in ‘Of Weft and Weave’, which is some way behind the take-up of ‘Leiyatel’s Embrace’, so I may find more people commenting eventually. It’s the same with the bits of verse all my books contain, although they are strictly a part of the story - not grafted on gratuitously, you understand. This also rarely gets a mention, but in this case the verse is genuinely key to the tale. 10. What is the best thing or most surprising thing about being an author? Oh dear, I’m not sure I’m qualified to answer that! It would seem reasonable to assume that an author makes their living by writing books, which I certainly don’t. I don’t feel like an ‘author’, I must say. Is there meant to be a point after which you feel different? Start wearing cravats and smoking cigarettes in long holders, or something? 11. The last question is a bit of a freebie: What is the one thing you wish I had asked you, but didn’t? Now go ahead and ask and answer it. Your writing style is unusual, in this day and age, in being quite slow paced. Why is this? 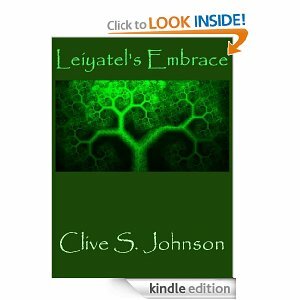 That’s certainly true of ‘Leiyatel’s Embrace’, which starts out very leisurely, but it’s to match the somnolent, ancient state of the realm of Dica. It’s all part of what I mentioned earlier, that feel of the place that was my very own first meeting with the realm. Dica hasn’t changed substantially over hundreds of years, and so it was important to set the pace accordingly, to ease the reader into its almost stagnant atmosphere. This, I then felt, added contrast to the later and culminating pace. I wanted it to be a bit like being on a slippery slope, one where the gentle camber carries you unknowingly to a hidden surprise. 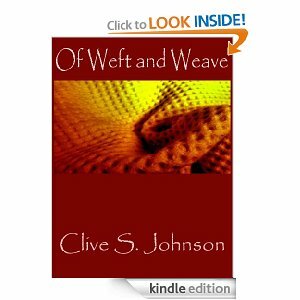 ‘Of Weft and Weave’ puts the reader in a parallel period, but one of greater change, one where a slightly faster pace is appropriate. It’s still not a breakneck speed, by any stretch of the imagination, but it complements the broader reach of the story, its greater busyness and a range that this time goes beyond the realm’s borders. When ‘Last true World’ is available, readers might be surprised by its far pacier narrative. It moves on from the period of the first two books, and into a time of far faster change, and so my writing style had to reflect that. I hope those who’ve enjoyed my slower prose style aren’t too shocked, but please don’t blame me, as I confessed earlier, I’m not really the author, but only his scribe. Check out Clive's books on Amazon.